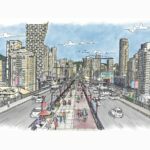 A massive new development with the tallest residential tower in Western Canada is set to transform a Burnaby intersection and SkyTrain station. 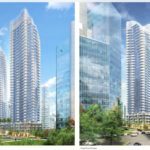 Onni has begun marketing the highly-anticipated Gilmore Place, a 10-tower residential, office and retail development around the Gilmore SkyTrain station on the Millennium Line. Phase one will include three residential towers, with the tallest “signature” tower around 65 storeys tall, making it the tallest residential tower west of Toronto. The two other towers in phase one will be around 55 storeys tall. 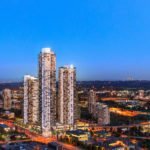 The signature tower will be taller than the Trump Tower, Shangri-La and upcoming Burrard Place towers in downtown Vancouver. 100,000 sq. ft. of commercial space is also proposed in the first phase, as well as an yet-to-be-determined amount of office space. 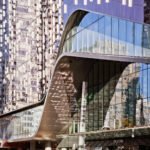 Gilmore Place will be integrated with the SkyTrain station, featuring public plazas and retail surrounding the rapid transit station. In total, four phases are proposed at Gilmore Place, with towers in phases one, two and three between 35 and 50 storeys, as well as 500,000 sq. ft. of office space and 185,000 sq. ft. of retail. 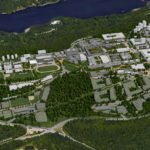 The development is targeting a LEED Gold certification, according to City of Burnaby documents. The development’s architects are IBI Group. Gilmore Place: a master-planned community that will transform Burnaby’s western gateway into an incredible urban hub for residents and visitors alike. Featuring Western Canada’s tallest residential tower, the seamlessly-integrated Gilmore SkyTrain Station, world-class shopping and entertainment, convenient office space and luxurious residential towers, Gilmore Place will redefine metropolitan living in one of Burnaby’s most up-and-coming neighbourhoods, Brentwood. Live above your own city centre, with stunning panoramic views, contemporary finishes, and unrivalled amenity spaces exclusive to residents. The Brentwood area of North Burnaby is transforming, with redevelopment of the Brentwood Town Centre shopping mall by Shape Properties. 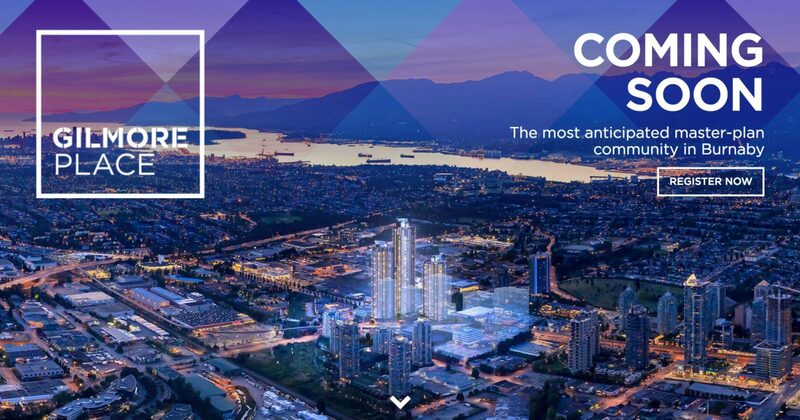 When complete, “The Amazing Brentwood” will be home to 10 new towers up to 60 storeys tall, as well as a new outdoor shopping mall integrated with the SkyTrain station. 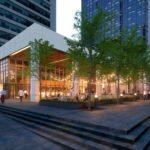 Complete build-out of the Gilmore Place development is expected to take up to 15 years. Views from Gilmore Place, looking west towards downtown Vancouver.